Leachate is defined as liquid that has come into contact with waste. In a conventional landfill, leachate trickles down through the waste mass and into the leachate collection and removal system (LCRS) at the base of the landfill. 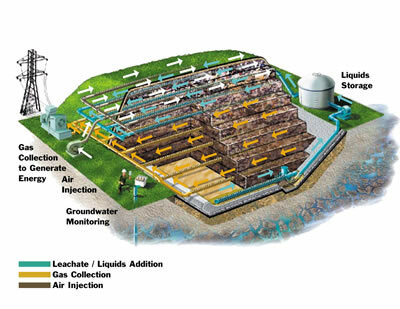 In a bioreactor landfill, pipes are installed throughout the landfill to recirculate the leachate as evenly as possible throughout the waste. Leachate can be distributed horizontally or vertically, but the optimal method of even distribution depends on the characteristics of the specific landfill. COD is the capacity of a body of water to consume oxygen during oxidation of inorganic chemicals (such as ammonia) and the decomposition of organic material. In contrast, BOD measures aerobic microorganisms' oxygen demand by microbial oxidation. The COD, in the case of landfills, is typically higher than the BOD, as shown in Figure 1. The higher the COD and BOD, the more the leachate is oxygen-deficient. In the initial stages after waste is deposited in a landfill, the BOD and COD quickly rise as the oxygen and nitrogen is depleted. As the organic matter is oxidized into methane and CO2 gases, the BOD and COD fall and reach a stable level. 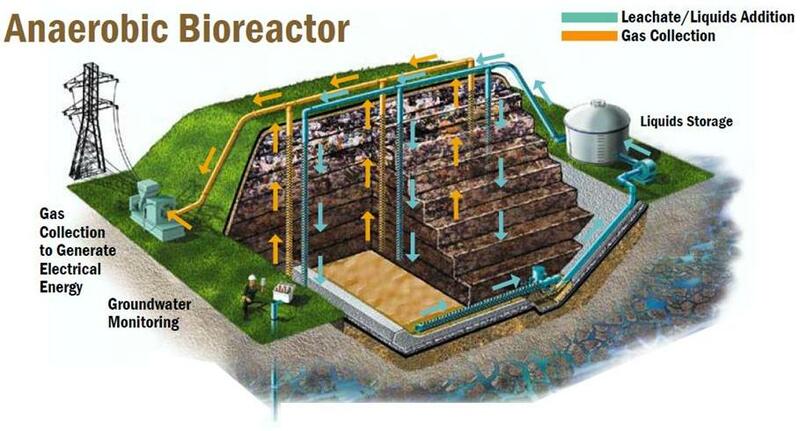 In a bioreactor landfill, stable levels are reached much faster than a conventional landfill. The lower the final BOD and COD, the less leachate treatment for organic matter is required upon leaving the landfill. However, with leachate recirculation, a potential issue that arises is large concentrations of heavy metals in the leachate. Extra treatment for heavy metal removal may need to be added post-circulation. Most aerobic reactors use a dual process: first acting as an aerobic reactor to accelerate the biodegradation of organic matter and then encouraging quicker methanogenesis during an anaerobic stage. Another added benefit of the dual bioreactor is more destruction of volatile organic compounds in the waste. (Waste Management Inc, 2015) Differences in leachate distribution systems between aerobic and dual systems is shown below. Tracking of leachate parameters can take place either in-situ within the landfill or within a leachate tank outside of the landfill. There has not been substantial research on leachate monitoring via sensors in the landfill; most of the current data on leachate parameters has been compiled from tests in recirculation tanks (see Figure 4). Each parameter is tested using methods described in the American Public Health Association’s (APHA) 1989 Standard Methods for the Examination of Water and Wastewater (SMWW). One method to measure BOD and COD is using SMWW’s oxygen-consumption rate test. First, an oxygen-consumption rate device, such as a probe with an oxygen-sensitive electrode, is calibrated at a temperature similar to measured temperatures in the landfill. Then, the dissolved oxygen (DO) content of a leachate sample is increased by shaking the sample in a partially filled bottle or bubbling oxygen through it. The sample is added to a BOD bottle along with a biological suspension and a magnetic stirring bar, and the DO level is measured with the oxygen-sensitive probe and recorded. (APHA, 1989) The difference in the DO level over a period of five days represents the BOD5 value (a standard measurement of BOD). To determine the TDS of the leachate, standard methods consist of filtration to remove suspended solids, drying, and then measurement of the remaining mass. The bulk of TDS is made up of dissolved inorganic ions and organic matter. The inorganic ion (Cl-, SO42-, HCO3-, Na+, K+, Ca2+, Mg2+, etc) concentrations are measured using ion chromatography. The dissolved ion concentrations can provide information on the strength of the leachate; the concentrations generally increase over time as the leachate becomes less diluted with repeated circulation. (Townsend et al. 2015) The pH and temperature of the leachate can be measured either in the recirculation tank or within the landfill with simple pH and temperature meters, probes, and calibration fluids. Leachate is either immediately sent off to a wastewater treatment plant or receives partial on-site treatment before getting transported to a treatment plant. Some of the treatment can even occur in the leachate recirculation tank. The fraction of leachate that is re-circulated and the fraction that is removed from the waste mass for treatment should be carefully controlled. Some issues that may arise from over-circulation include ponding and overly acidic conditions. (Townsend et al. 2015). Overly acidic conditions disrupt the leachate treatment process, and pools of leachate within the landfill could be difficult and costly to remove. The leachate can continually circulate through a section of the landfill even after the section is closed off to new waste until full stabilization in achieved. When the leachate COD is less than 1,000 mg/L and BOD is less than 100 mg/L, and the BOD:COD ratio is less than 0.1, and the gas production drops to 5% of its peak value, the waste is officially considered to be stabilized (Townsend et al. 2015). Sensor data is logged in an automatic data collection system. This technology was piloted at full scale in Jackson, MI in 2004, and the results indicated that the blankets were both hydraulically efficient for through leachate recirculation and cost-effective (Khire, 2004). Figure 5: Testing permeable leachate circulation blankets in Jackson, MI. The blankets were created with shredded recycled tire scraps (left) and part of the automated sensor monitoring system is shown on the right. In 1994, Yolo County, California began a field-scale test that compared anaerobic cells to aerobic cells in a landfill utilizing leachate recirculation. To distribute the leachate, horizontal trenches filled with shredded vehicle tires were installed throughout the landfill. The results indicated that the aerobic reactor allowed for greater organic decomposition than the anaerobic reactor because both aerobic and anaerobic reactions were able to take place throughout the waste mass. This was partially due to dead zones where flow did not reach, as well as "preferential flow pathways" where the tire-filled trenches were not able to evenly distribute the leachate (Townsend et al. 2015). Air was added to the aerobic section by using a vacuum system in the gas collection pipes to pull air in through a permeable soil cover. However, a major issue that arises from having a permeable cover is the seepage of water into the landfill during rainfall events, uncontrollably increasing the amount of circulated leachate.